More than 80 middle school students completed field research and learned about the positive impact of the Onondaga Lake cleanup during Honeywell Summer Science Week. Now celebrating its 13th year, Honeywell Summer Science Week, which is organized by the Milton J. Rubenstein Museum of Science & Technology (MOST), has inspired more than 800 students through hands-on science exploration in the Onondaga Lake watershed. The program brings science to life as students learn from scientists, engineers, professors, and college students about the watershed and associated environmental sciences. Honeywell Summer Science Week helps motivate students by improving their science aptitude and confidence, and encourages them to work toward careers in science, technology, engineering, and math (STEM). Watch a video about the impact of Honeywell Summer Science Week. During Honeywell Summer Science Week, students spend more than 40 hours as field scientists. Left: Skylar Brown (right), a student in the East Syracuse Minoa Central School District, works with counselor Gretchen Messer, a visiting professor at the State University of New York College of Environmental Science and Forestry (SUNY-ESF), to collect and identify samples of aquatic macroinvertebrates in Onondaga Creek. Right: Julah Zuckerbraun, a student in the Syracuse City School District, tests Onondaga Creek’s water quality with the help of counselor Christopher Thomas, a student at SUNY-ESF. Students learn from habitat experts and engineers about the Onondaga Lake cleanup at Honeywell’s Onondaga Lake Visitors Center. Left: Matt McDonough, a habitat expert from Parsons, shows students a fish caught in Onondaga Lake. Right: Honeywell Summer Science Week students Sarah Fettig (left), of the West Genesee Central School District, and Tess Schmidt, of the Fayetteville-Manlius School District, complete an engineering activity to learn about the Onondaga Lake cap. 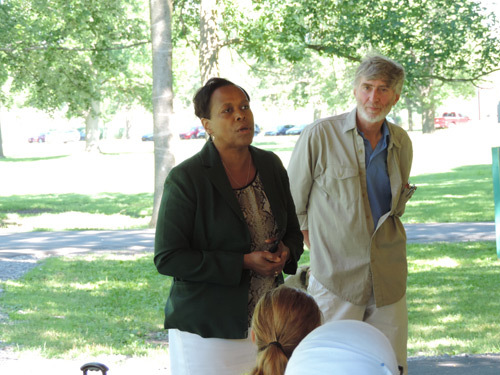 On opening day, City of Syracuse Deputy Mayor Sharon Owens joined Honeywell and the MOST at a kickoff event at Onondaga Lake Park. Throughout the week, students participated in a variety of field activities, such as collecting water samples throughout the Tully Valley and the Onondaga Lake watershed, and exploring Clark Reservation and Onondaga Creek. Students also learned about the fish in Onondaga Lake, underwater mapping, and the engineering behind the lake bottom cap. “This program is an unparalleled science experience for students. We appreciate Honeywell’s continued support in helping the MOST teach the workforce of the future,” said MOST Interim President Lauren Kochian. The students reunited on Honeywell Discovery Day to discuss scientific findings. Students were joined by family members and teachers as they presented their observations. Left: Students Peter Santoro (left), of the Liverpool Central School District, and Symeon Barrett, a home-schooled student, present their observations to Honeywell Syracuse Program Director John McAuliffe. Right: Honeywell Summer Science Week students receive completion certificates and become “MOST Associates,” which grants each student a one-year museum pass. Local companies, organizations, and individuals participating include: Montezuma Audubon Center, U.S. Geological Survey, OBG, Parsons, Onondaga County Department of Water Environment Protection, and faculty and graduate students from Syracuse University and SUNY-ESF. Honeywell Summer Science Week is sponsored by Honeywell Hometown Solutions, the company’s corporate citizenship initiative that focuses on five areas of vital importance: Science & Math Education, Family Safety & Security, Housing & Shelter, Habitat & Conservation, and Humanitarian Relief. Together with leading public and nonprofit institutions, Honeywell has developed powerful programs to address these needs in the communities it serves. For more information, please visit http://citizenship.honeywell.com/hometown-solutions.